The upcoming reboot of the long-running (in Britain) quiz show Mastermind will hopefully put me back in my intellectually self-satisfied box. I remember when Mastermind (Australia) aired in the eighties. Vaguely. The quizmaster was called Huw. Actually I don’t remember that much. Youtube has come to the rescue of course and I’ve binged on the UK Mastermind. With its absurdly esoteric special subjects such as “Pirates of the 17th Century”, I don’t answer (aloud to myself) many questions in the first round. When it comes to general knowledge I fare better. Naturally by the time I’d cottoned on to the new series to be hosted by Jennifer Byrne -a great choice- the applications had closed, for the time being at least. In 2005 I was a contestant on both The Einstein Factor and Rockwiz. For those who didn’t tune in, Peter Berner asked the questions on the former with a special subject round, a multiple choice round, and finally general knowledge. Yes, it does sound like Hard Quiz. It was similar but with a heap more special subject questions. I won my heat, with The Beach Boys as my subject of interest. There was a ‘brains trust’ as well. On my episode it was helmed by Barry Jones (and although I don’t remember the former politician and polymath on the ancient BP Pick A Box, I have seen footage of his epic performances). They competed in the last round as well, which put a bit of a spanner in the works. Returning for the semi-final, I lost, fair and square to a fellow with an impressive trigger finger. I think I won a mug and a T Shirt. Clearly this wasn’t how you made money out of TV game shows. On Rockwiz my team was triumphant, thanks largely to Tim Rogers of You Am I who knew everything. The program I really wanted to get on was Million Dollar Minute, which aired on Seven a few years back and is repeated now on 7Two. Hosted by the eloquent and understated Simon Reeve. This was pure quizzing; three contestants, a whole bunch of questions and one winner, who could boost their winnings and choose to either leave or return to risk their stash by answering five supplementary questions. I guess I did something wrong in the audition. I think they just thought I was “too weird”. The same thing happened when I tried to get on Sale Of The Century. I think I was a bit cocky when everyone who’d passed the written test had to talk a bit about themselves. I was one of the few who didn’t falteringly admit that their wives had applied for them (which I found unbelievable) as I spruiked my then band’s new record. It was a bad move. Matt Parkinson, now better known as Goliath on The Chase (and a member of the Brains Trust on my Einstein factor semi) won big on Sale Of The Century. Brydon Coverdale, The Shark on The Chase won $307 000 on Million Dollar Minute, but it was Lisa Paton who lingers in the memory. She opted to risk half a million bucks on Who Want’s To Be A Millionaire, which she could have walked away with, to try for one million. She lost and had to settle for $77 000, which is nothing to be sneezed at … unless you’ve just blown up a six figure windfall. The million was won, once, by Andrew Skarbek who is not a Chaser for reasons unknown, possibly based on his lack of discernible personality. The shows I failed to appear on however were mere grist for my mill, as I set about writing a novel based on, well, myself and my quiz show tribulations. With an epic romance woven in of course. Penguin published Buzzed and all my vented frustrations were there for the reader. Those frustrations are not so much about my lack of success in appearing on more quiz shows but more the staggering lack of knowledge displayed by a lot of contestants. Now I’m clearly not Chaser material. I would receive a sound whipping at a trivia night by any of them. The backgrounds of The Nerd, The Beast, the Governess and The Tiger Mum are crammed with wins on various programs as well as the Australian Quizzing Championships, which Issa Schultz won far too many times. Also the chances of me getting past the second round are probably 50-50. The chances of then compiling a team good enough to beat The Chaser in the final round are about 30-70, and if all that happened, the cash winnings (divided by anyone else at the table) would amount to probably not much at all. It’s with this in mind that a) I don’t really care about The Chase, and b) I’m puzzled when people asked what they’d do if the won some cash say things like “I’d take the whole family for a holiday on Mars”. A week in Surfer’s Paradise maybe. 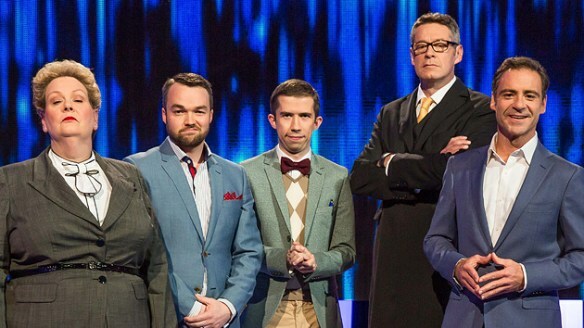 The Chase contestants, as well as dressing badly (but that’s just me being snooty) simply aren’t much good. My problem is I’m not much good at anything except trivia and useless facts. I’m bordering on unemployable such is my lack of knowledge about the specifics of anything. I have no idea why I know a fair bit about most things. My father was similarly poly-knowledgable but he could also build a cupboard and put up shelves. I think I could give some advice to Chase contestants. First if the questions begins, “Which city …” don’t answer with a COUNTRY. The same goes for continents. Also, unless someone is called Mackenzie McScot, any question about which country of the UK someone was born in will be England. If you have a choice of two possibilities, for example, “In which North American country …” don’t pass. It’s either the US or Canada. If an Austrian is a “superstar” in his sport it’s either Formula One or skiing, because Austrians can’t do anything else. This all seems self-evident but allegedly clever people who do complicated jobs clearly requiring intelligence, are complete nuff-nuffs with general knowledge. I have to admit I don’t watch The Millionaire Hot Seat. All I know is, one bad answer would see me out of the door. In the words of a great philosopher; sod that for a game of soldiers. The most difficult quiz show I’ve come across and one where I answer more or less zero questions is Only Connect, a British program hosted by Victoria Coren-Mitchell, wife of David Mitchell. The idea is to find the connection between four words or four numbers or four pieces of music, and it’s verging on impossible. Lateral thinking comes to the fore in this case. And most teams manage it brilliantly. Mind you, if they ever do a local version … where do I sign up? Michael Witheford has written about music and film for Juke Magazine, the Age, The Sydney Morning Herald, Australian Musician and various periodicals. He is working on his third book. Michael now lives in Tasmania and has no choice but to watch a lot of Television.